Photograph, Portrait of Dillon Anderson. Image available on the Internet and included in accordance with Title 17 U.S.C. Section 107. 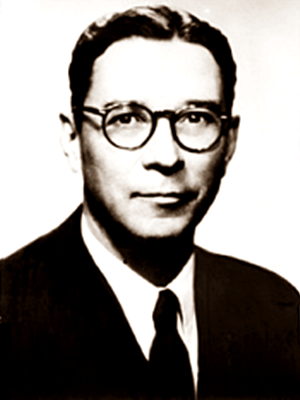 ANDERSON, DILLON (1906–1974). Dillon Anderson, statesman and writer, son of Joseph Addison and Besnie (Dillon) Anderson, was born in McKinney, Texas, on July 14, 1906. He enrolled at Texas Christian University before transferring to the University of Oklahoma, where he received a B.S. degree in 1927. He graduated from the Yale law school in 1929; that same year he was admitted to the Texas bar and began practicing with the Houston firm of Baker, Botts, Andrews, and Shepherd (see "BAKER AND BOTTS). He was made a partner of the firm in 1940. Anderson served as a colonel in the United States Army from 1942 to 1945. He won the Army Commendation Ribbon and the Legion of Merit. He was appointed consultant to the National Security Council in 1953, and President Dwight D. Eisenhower chose Anderson to be his special assistant for national security in 1955. In that capacity, Anderson presided over the National Security Council and accompanied Eisenhower to the summit conference in Geneva in 1955. He resigned in 1956. In 1948 Anderson met Edward Weeks, editor of Atlantic, who complained that J. Frank Dobie, Tom Lea, and John Lomax were the only Texans who ever sent contributions to his magazine. When Weeks asked Anderson if he knew of other Texas writers, Anderson volunteered to contribute, even though none of his fiction had been published. Anderson's first submission was "The Revival," a story that Weeks returned several times for revision. It was finally published in 1949 and won the Doubleday company's O. Henry prize for short fiction. Anderson then began publishing other stories in Atlantic, Saturday Evening Post, and Collier's. In 1951 Little, Brown, and Company brought out I and Claudie, which won the Texas Institute of Letters award that year. Little, Brown also published Anderson's second book, Claudie's Kinfolks, in 1954. Both books are accounts of the picaresque adventures of two fun-loving rogues who philosophize in homespun, practical fashion about life and the world. Though published as novels, both I and Claudie and Claudie's Kinfolks had been written as series of short stories. The same was true of The Billingsley Papers (1961), published by Simon and Schuster, although Anderson did develop a logical sequence for the stories. The "papers" make up a report in which attorney Gaylord Boswell Peterkin reveals the true character of fellow attorney Richard K. Billingsley to the university faculty committee conferring an honorary doctorate of laws degree on Billingsley. Despite their loose structure, all three books won praise for their picture of life among the folk and the exuberant, if not always tasteful, pursuits of the Texan. Picture of the grave of Dillon Anderson in Houston, TX. Image available on the Internet and included in accordance with Title 17 U.S.C. Section 107. Anderson was a director of Westinghouse Electric Corporation, a trustee of the Carnegie Endowment for International Peace, and a member of the Texas Institute of Letters. He married Lena Carter Carroll on May 30, 1931. The Andersons and their three daughters made their permanent home in Houston. Dillon Anderson died in Houston in 1974 and is buried there. Austin American-Statesman, March 16, 1955. Dallas News, November 7, 1954. Vertical Files, Dolph Briscoe Center for American History, University of Texas at Austin. Who's Who in the South and Southwest, Vol. 2. Handbook of Texas Online, Joyce Glover Lee, "ANDERSON, DILLON," accessed April 19, 2019, http://www.tshaonline.org/handbook/online/articles/fan31. Uploaded on June 9, 2010. Modified on August 29, 2016. Published by the Texas State Historical Association.